First referenced last month as arsenicCatnip in a ROLEPLAYING SESSION with another troll, Nepeta wears RETRACTABLE CLAWS in addition to her "fursuit", and rides a GIANT CAT. Naturally, her sign is Leo. Homestuck is a convoluted animated story following a group of children in a multiplayer sandbox game, SBURB, superimposed on their own world in a mix of AUGMENTED REALITY and ALTERNATIVE REALITY. The story is largely told through reader-suggested commands to the players. Throughout the game, the kids have been trolled with varying degress of mercy by a prior group, whose story is only now being told in full. 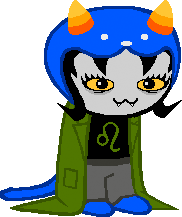 Furs have been present in Homestuck since the INTRODUCTION of main character JADE HARLEY at the start of Arc 3 as a LIFELONG FAN OF ANTHROPOMORPHOLOGICAL FAUNA (though NOT FURSUITS). Both Jade and Nepeta are represented by the colour green. On the plus side, at least he knows how to stay in shape.